Wayne Farms | Favorite Foods, Inc.
POULTRY LEADERS SUPPORTING THE WORLD’S TOP BRANDS. 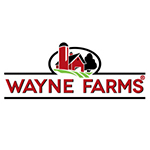 At Wayne Farms LLC, excellent poultry is our pride and purpose. We produce products that connect with and support many of today’s well-known brands. And we know that by being our best, we’re able to help our customers do the same. Learn more about who we are and the history that led us to become one of the key players in the U.S. poultry industry.